Enveloped, spherical to pleomorphic, 150-200 nm in diameter, T=16 icosahedral symmetry. The capsid consists of 162 capsomers and is surrounded by an amorphous tegument. Glycoproteins complexes are embedded in the lipid envelope. Monopartite, linear, dsDNA genome of 120-180 kb. The genome contains terminal and internal reiterated sequences. Each viral transcript usually encodes a single protein and has a promoter/regulatory sequence, a TATA box, a transcription initiation site, a 5' leader sequence of 30-300 bp (not translated), a 3' nontranslated sequence of 10-30 bp, and a poly A signal. There are many gene overlaps. There are only few spliced genes. Some of the expressed ORFs are antisense to each other. Some ORFs can be accessed from more than one promoter. There are some non-coding genes. There are three types of genes: immediate-early (? ), early(?) and late (?). The ? genes are transcribed immediately after infection and ensure the transcription of ? genes, which encode the proteins necessary for the viral replication. The ? genes mostly encode structural proteins. Standing apart are genes expressed during latency. The viral proteins VHS and ICP27 are involved in shut-off of host protein translation in order to ensure the selective expression of viral proteins versus cellular proteins. Attachment of the viral gB, gC, gD and gH proteins to host receptors mediates endocytosis of the virus into the host cell. Fusion with the plasma membrane to release the core and the tegument proteins into the host cytoplasm. 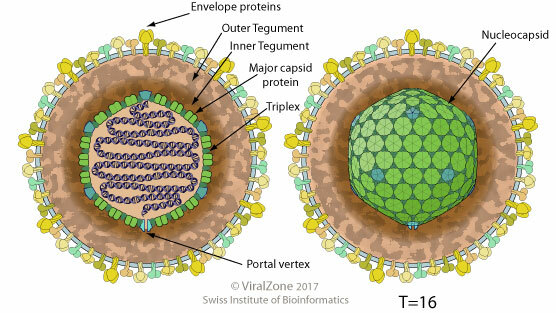 The capsid is transported to the nuclear pore where viral DNA is released into the nucleus. Transcription of immediate early genes which promote transcription of early genes and protect the virus against innate host immunity. Transcription of early viral mRNA by host polymerase II, encoding proteins involved in replication of the viral DNA. Synthesis of linear concatemer copies of viral DNA by rolling circle. Transcription of late mRNAs by host polymerase II, encoding structural proteins. Assembly of the virus in nuclear viral factories and budding through the inner lamella of the nuclear membrane which has been modified by the insertion of herpes glycoproteins, throughout the Golgi and final release at the plasma membrane. Latent replication : replication of circular viral episome in tandem with the host cell DNA using the host cell replication machinery. TRANSMISSION HHV-1: contact with lesions and body fluids. HHV-2: sexual. Infection at birth by a genitally-infected mother. ANTIVIRAL DRUGS Nucleoside analogs (Acyclovir, famciclovir, valacyclovir...). These drugs are activated by the viral specific enzyme, thymidine kinase, and are therefore specific to herpes-infected cells. These drugs act against the replicating virus (they are incorporated into the DNA as it is copied) and are ineffective against a latent virus. Apoptosis is very often modulated (and usually inhibited) by alpha-herpesviruses. Herpes virus simplex protein US3 activates host protein kinase A/PKA to block apoptosis. Additionally, it also interacts with programmed cell death protein 4 (PDCD4) and retains it in the nucleus thereby inhibiting host apoptosis . Several alpha-herpesviruses are able to inhibit host cell autophagy process, such as HHV-1 ICP34.5 that interacts with Beclin-1 and stop autophagosomes development . The UL24 protein that is present in all herpesvirus subfamilies (alpha, beta and gamma-herpesviruses) induces a cell cycle arrest at G2/M transition through inactivation of the host cyclinB/cdc2 complex . Herpes viruses inhibit the cascade leading to production of interferon-beta by mainly targeting the host IRF3 protein. Thus, herpes simplex virus or varicella virus possess proteins to prevent IRF3 activation. HSV-1 ICP27 is an alternative splicing regulator of host mRNA. This protein is conserved in several herpesviridae genera. It has been shown to act as a splicing silencer at the 3' splice site of the PML intron 7a .